When you think of Texas, you think of cattle, wide-open spaces and dirt lanes. But Texas also calls to mind the cities it's famous for - San Antonio, South Padre Island, Corpus Christi, Austin, Houston and, last but not least, Dallas. Dallas is the third-largest (as estimated by the United States Census Bureau on 1 July 2006) city in the state of Texas and the ninth-largest in the United States. The city covers 385 square miles and is the seat of Dallas County. Downtown Dallas is undergoing a slow-pace urban renewal, as well as expansion. Traditionally bound within a belt of above-ground expressways and consisting of anonymous highrise towers between parking craters, it is now rediscovering walkability, street-level retail and public transit such as the M-Line tram, operated using historic vehicles. It has also expanded northwards and merged with a part known as Uptown immediately north of it thanks to a new park developed between them, while artsy locals flock east to a low-rise neighbourhood behind the freeway known as Deep Ellum. 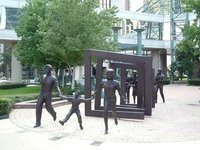 It is in Downtown that you will find most of Dallas' surviving historic architecture and monuments, as well as major cultural institutions, museums and art galleries. It also has multiple concentrations of restaurants and bars and a number of upscale hotels for the monied traveller to choose from. North Dallas includes several upscale neighborhoods, north of the Park Cities and mostly south of LBJ and extends far north to Addison. It encompasses Lake Highlands, a largely residential area bordering Garland on the north and Mesquite on the east, as well as Park Cities - Highland Park and University Park - one of the wealthiest areas of the city, mostly residential, but also offer world-class shopping opportunities. University Park is home to Southern Methodist University (SMU), the Meadows Museum at SMU, and the George W. Bush Presidential Library. South Dallas includes areas south of the I30 Interstate Highway and the southwestern bank of the Trinity River. It is home to the Texas State Fairgrounds, Fair Park is open all year and is home to multiple museums. The Cotton Bowl is at Fair Park, and the University of Texas and University of Oklahoma face off on the gridiron here every year in the fall during the Texas State Fair. The Exposition Park neighborhood across from Fair Park and the DART Fair Park stop, is a little hamlet of hipster bars, clubs, and restaurants. In its west, across the Trinity River, you will find Oak Cliff - a large low-income, mainly residential district southwest of downtown. North Oak Cliff or "Kessler Park" is another "streetcar suburb" and is home to upscale homes, from vintage 1930's bungalows, to mid-century modern, to new contemporary. The Bishop Arts District, centered on Bishop and Davis streets, is one of the City's hottest areas for new restaurants, cafes, and boutiques, drawing an eclectic crowd in which the creative class and the gay community are well-represented. North Oak Cliff is a slice of Austin in Dallas. West Dallas refers to actually a tiny part of the Western part of Dallas right south of the Trinity River, largely a blighted area of poverty, but it does feature the one-of-a-kind Belmont Hotel, which has arguably the best views of downtown. West Dallas is easily connected to the Oak Cliff area, and is poised for re-development as part of the Trinity River Project, and the under-construction Hunt-Hill Bridge across the Trinity River, designed by famed Spanish architect, Santiago Calatrava. If you like the nightlife, Dallas' arts and entertainment district Deep Ellum is for you. Many streets in Deep Ellum are blocked off on the weekends, but finding parking isn't a problem. Full of all kinds of music (rap, rock and indie music are the most popular), Deep Ellum has quite a collection of clubs to choose from. With art galleries, restaurants, tattoo parlors, live music venues, bars, and dance clubs, you're sure to find something in Deep Ellum to interest you. If you're traveling with kids, or a nature/animal lover, the Dallas Zoo, Dallas Arboretum and Botanical Gardens and Dallas World Aquarium are good places to visit. If you're up for the short ride into Grapevine, they hold several carnivals/festivals: Main Street Days Outdoor Adventure and GrapeFest. If you want to take a trip to Ft. Worth, there's the Kimball Art Museum, Ft. Worth Zoo and the Ft. Worth Botanical Gardens. Dallas also hosts the State Fair of Texas. There are also several choices in the way of culture and art, including the Dallas Museum of Art, the Nasher Sculpture Center, the Majestic Theater, the Dallas Opera, and the Dallas Symphony Orchestra, which performs in the I.M. Pei-designed Morton Meyerson Symphony Center. Dallas may be best known for its shopping. Downtown Dallas is home to the original Neiman Marcus department store at Main and Ervay. World-class shopping can be found at NorthPark Center at US 75 and Loop 12. NorthPark features its own Neiman Marcus store as well as Macy's, Nordstrom, Dillard's, Barney's, and the Apple Store. Further north, at I-635 and Dallas Parkway is the Dallas Galleria. This giant complex features three levels of shopping beneath a vaulted glass ceiling, an ice-skating rink, a Westin Hotel, Macy's, Saks Fifth Avenue, Nordstrom, and a number of restaurants including Mi Cocina (offering views of the ice rink) and the Grand Lux Cafe. The State Fair of Texas is held annually in Fair Park, approximately two miles east of downtown. Fair Park is home to the world's largest collection of Art Deco exhibit buildings, most of which were built for the 1936 Texas Centennial Exposition and were painstakingly restored in the 1980s. The State Fair is held several weeks during the fall. To coincide with the State Fair, the Fair Park Music Hall usually hosts a Broadway musical. Dallas has a humid subtropical climate, yet this part of Texas also tends to receive warm, dry winds from the north and west in the summer. Winters are generally mild, with typical daytime highs between 10 °C and 18 °C and nighttime lows between -1 °C and 10 °C. However, strong cold fronts known as "Blue Northers" sometimes pass through Dallas, plummeting nightly lows below zero. Snowfall is seen on average 2-4.5 days out of the year and snow accumulation is typically seen at least once every winter. A couple of times each year, warm and humid air from the south overrides cold, dry air, leading to freezing rain, which often causes major disruptions in the city if the roads and highways become dangerously slick. On the other hand, daytime highs above 65 °F are also not unusual during the winter season. In sum, extremes in weather are more readily seen in Dallas and Texas as a whole than along the Pacific and Atlantic coasts, due to the state's location in the middle of the U.S.
Spring and autumn bring pleasant weather to the area. Vibrant wildflowers (such as the bluebonnet, Indian paintbrush and other flora) bloom in spring and are planted around the highways throughout Texas. Springtime weather can be quite volatile, but temperatures themselves are generally mild. The weather in Dallas is also pleasant between late September and early November, and unlike springtime, major storms rarely form in the area. There are several airports in Dallas, though most travelers will only need to know of two of them. Dallas/Fort Worth International Airport (IATA: DFW, ICAO: KDFW, FAA LID: DFW) is about fifteen miles (24 kilometres) northwest of the centre of Dallas and about the same distance northeast of downtown Fort Worth. This is the largest airport in the region and the one most international visitors will arrive at when visiting Texas. It is the largest, and main, hub for American Airlines and its affiliate, American Eagle. The airport has five semi-circular terminal buildings designated by letters (A through E). Terminal D is the newest, and is the designated international terminal. All terminals are served by a new, elevated, fully-automated tram system called Skylink. The Skylink system is free to use and runs every two minutes. All stations are inside the security perimeter, so transfers between terminals can be made without having to pass through security a second time. Rail: The airport is served by the Trinity Railway Express commuter rail line at CentrePort/DFW Airport Station, south of the airport. The line serves both downtown Dallas and downtown Fort Worth. To reach the airport from the station, you have to take a shuttle bus and transfer to another bus serving either Terminals A and C, Terminals B and E, or Terminal D.
Bus: Dallas Area Rapid Transit (DART) offers bus service to downtown Dallas and Irving on Route 310 to Express Route 202 at the North Irving Transit Center. There are some shuttle services and plenty of taxis available. Also, rental cars are available with many companies, including Hertz, Avis, Budget, Alamo/National, Enterprise and Trifty. Dallas Love Field (IATA: DAL, ICAO: KDAL, FAA LID: DAL) is Dallas' second-largest airport and is about five miles (8 kilometres) from the centre of Dallas. Love Field was the main airport for Dallas until DFW opened in the early '70s. With only three runways and twenty gates, Love Field isn't as busy as DFW, which some people prefer. Love Field is primarily served by Southwest Airlines, though a few other carriers have operations there as well. Note that Southwest Airlines does not operate out of DFW, so any travel involving that carrier will be through Love Field. The Texas Eagle operated by Amtrak travels between Dallas and Chicago, stopping in St Louis as well. It also goes south towards San Antonio. Dallas is well served by a number of Interstate and other limited-access highways which offer direct access to all of the major urban centers in the region, including Houston, Oklahoma City, Austin, and San Antonio. High-quality maps are offered for free at the state's visitor centers. The map, along with a free travel guide, can be requested in advance of a visit by visiting the state's tourism website. Greyhound Bus Lines serves Dallas. Their terminal is located downtown at 205 South Lamar Street. The terminal is three blocks from the DART light-rail line as well as numerous city bus lines. Dallas is much easier to see by car than cities like San Francisco or Chicago. Ample free parking can be found anywhere outside of the downtown districts. A large network of freeways lays over the city like a web, and a grid of wide arterial surface streets makes navigation easy. Freeways should be avoided during morning and afternoon rush hours on weekdays. Plan your trips around these times and most traffic snarls can be avoided. Toll roads to be aware of are the Dallas North Tollway and the President George Bush Turnpike, operated by the North Texas Tollway Authority (see their website for toll rates). Dallas has the most extensive light rail system of any city in Texas. Both the light rail system and the city bus system are run by DART, for Dallas Area Rapid Transit. Both the Red Line and the Blue Line connect downtown Dallas to the West Village shopping and entertainment area (via Cityplace Station) and Mockingbird Station, home to several restaurants as well as the Angelika Theater. The Red Line also stops at the front gate of the Dallas Zoo. The Green Line extends to the east and serves the front gate of Dallas Fair Park, home to the State Fair of Texas as well as Deep Ellum and Baylor Hospital. The Green Line will eventually offer a station at Dallas Love Field (airport); until it does, both it and DFW (the larger, international airport) can be reached from downtown by bus. While Dallas does have marked bike routes throughout the city, it does not have many designated bike lanes or paths. The city government has published The Dallas Bike Plan, which can be viewed at their website. The area bound by Haskell on the north, Woodall Rogers Freeway on the south, Turtle Creek on the west and Central Expressway on the east is where Dallas' beautiful people go to see and be seen. Trendy to the nth degree, this neighborhood contains very upscale fashionable clubs. Some of the hottest clubs, Medici, the Candleroom, and Sense are private. If you want to check out one of these places be sure to go with someone that is a member or have a concierge call ahead for you. Wish and Republic are also cool nightspots, with no membership required. No shorts, jeans, team jerseys, tennis shoes, or flip-flops. West End - This is an attractive enough historic neighborhood with buildings in a turn-of-the-century redbrick vernacular - the notorious Book Depository is one of them - in the northwest quadrant of downtown. The area is mostly popular with suburbanites and tourists out for dinner and a quick stroll around the neighborhood but has a number of bars as well. Deep Ellum is a district of bars, dance clubs, music venues and tattoo shops east of downtown on Main, Elm and Commerce streets. It is a hipster haven for young people and a weekend destination for music lovers of all ages. Lately, it has been stigmatized by a purported "crime wave," be sure to go in groups if you go on a weeknight. Uptown and McKinney Ave - This is where Dallas' beautiful people go to see and be seen. Trendy to the nth degree, this neighborhood contains very upscale fashionable clubs. Downtown is home to a burgeoning nightlife district and upscale restaurants. Some travelers may find it more convenient to stay in Irving closer the DFW airport, in Arlington near the amusement parks, or in one of the northern suburbs such as Lewisville, Carrollton, Plano, or Richardson. Sheraton Dallas Hotel, 400 North Olive St (Financial district), toll-free: +1-866-716-8134. Spacious rooms, quality furnishing. Reasonably sound proofed and quiet air conditioning (for USA). Connected to Convention Center. SpringHill Suites Dallas Downtown/West End, 1907 North Lamar St, ☎ +1 214 999-0500. La Quinta Inn & Suites Dallas Downtown (formerly Lawrence Hotel), 302 South Houston St, toll-free: +1-877-396-0334. An historic boutique hotel in the West End, which has been renovated. Across from the George Allen Courthouse and the closest hotel to Dealey Plaza and the Kennedy Sixth Floor Museum. Dallas Marriott City Center, 650 North Pearl St, ☎ +1 214-979-9000. Hotel Crescent Court, 400 Crescent Ct, ☎ +1 214 871-3272. Offers European-style rooms, a day spa, business center, meeting space and wedding facilities, and a private club. Magnolia Hotel, 1401 Commerce St, ☎ +1 214 915-6500, toll-free: +1-888-915-1110, fax: +1 214 253-0053. Re-opened in 1999 and is in the oldest high-rise building in downtown Dallas. Adorning the top of the building is a red lighted Pegasus, which is a permanent fixture in the Dallas skyline. The hotel offers great features, location and amenities, such as: complimentary beer, wine, soft drinks, breakfast and cookies and milk at bedtime. Le Méridien Dallas, The Stoneleigh, 2927 Maple Ave, ☎ +1 214 871-7111, e-mail: veronica.quevedo@lemeridiendallasstoneleigh.com. This renovated luxury boutique hotel is an historic property that is a staple of the neighborhood. This unique property features a skyline penthouse, Bolla Modern Italian restaurant, a full-service spa and top-of-the-line accommodations. The W Hotel, 2440 Victory Park Ln, ☎ +1 214 397-4100, fax: +1 214 397-4105. Very nice and has a modern feel. Check out Ghost Bar if you stay there. Hotel ZaZa Dallas, 2332 Leonard St (Uptown), ☎ +1 214 468-8399, toll-free: +1-800-597-8399. This boutique hotel features a variety of concept suites, meeting and wedding facilities, luxury day spa, and dining and nightlife spaces. We have a comprehensive list of accommodation in Dallas searchable right here on Travellerspoint. You can use our map to quickly compare budget, mid-range or top of the range accommodation in Dallas and areas nearby. This is version 82. Last edited at 11:27 on Dec 3, 18 by Utrecht. 125 articles link to this page.